Dr. Paros is very personable, easy to talk with, concerned and well-versed In the field of dentistry. I felt quite comfortablewith her and believes she is quite trustworthy in her opinions and recommendations. Dr. Paros is very personable, easy to talk with, concerned and well-versed In the field of dentistry. I felt quite comfortable with her and believes she is quite trustworthy in heropinions and recommendations. Very caring. My root canal was practically pain free. The hygienist and Dr. Paros made sure I was comfortable. Dr. Paros grew up in Joliet, Illinois. She has been in the dental field since 1993, starting her career as a dental assistant. She loved having the opportunity to help people and work with them on a one-on-one basis to improve their health. Dr. Paros attended Drake University in Des Moines, Iowa, where she majored in biology. While earning her Master of Science degree at DePaul University, Dr. Paros completed research in craniofacial development and was published in the Journal of Abnormal Development, Teratology. Dr. Paros earned her Doctorate of Dental Surgery at Baylor College of Dentistry-Texas A&M Health Science Center. Dr Paros is ultra focused on providing the ultimate dental experience to each and every patient. Each patient is treated with the utmost respect and gentle care from small children to the lovely older patients. Her treatment is customized according to each person. Some patients want fast and some like slow. She asks the right questions so she can better serve you. 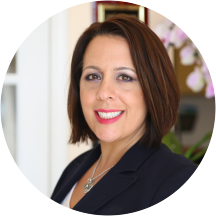 Over the past 20 years, Dr. Paros has completed Frank Spear Advanced Dentistry courses and is a member of many multidisciplinary study clubs, where she has kept current with cutting-edge technology and techniques. When she’s not in the office, Dr. Paros loves spending time with her adorable triplets, Eleni, Niko, and Georgia, and her husband, Sam. They love he outdoors and to explore the world around them. In her free time, Dr. Paros enjoys pilates, hot yoga and nature hikes. She's also passionate about holistic health and simply living life to the fullest! Dr Paros and all of her staff are friendly, caring, and professional. I, like many people, had put off seeing a dentist. Everyone at the High Point Dental Group made sure my experience was as relaxing as possible and really putme at ease. They truly exceeded my expectations. I am so glad I made my appointment. Very nice staff and professional. The plan for treatment was complete and they got right to work. Best dentist visit ive ever had!!! Everyone was friendly, helpful and surprisingly very open about the cost and benefit of everything they suggested. Very different experience that what I was led to belive by my colleagues. friendly and very informative and willing to answer questions. I enjoyed the office, staff, atmosphere and attitude. Very much enjoyed the "no-hassle" approach to the consultation and "plan of action". Will definitely love making this my new dentist. Was very happy with entire experience. Dr. Paros and her staff were wonderful with my son. They also put me at ease with their knowledge and care. I would definitely recommend Dr.Paros to anyone who is a little nervous about visiting the dentist. Great friendly enviroment from all parties. I was not pleased with the wait time but I understand things happen. She was great! She made me comfortable and welcomed.